Using GIS and data Analytics as a tool to understand Hudson city and extrapolate potential locations for the next OMI installation. How might we better understand hudson city and find the most suitable location for our next OMI installation? “The new OMI installation aims to act as a catalyst for bringing the community together. Acting as a microcosm of Hudson. Hudson is an eclectic city, one that has transformed itself into an arts and Antique hub,one with urban fabric that contributes extensively to showcasing an teaching its history and the arts. 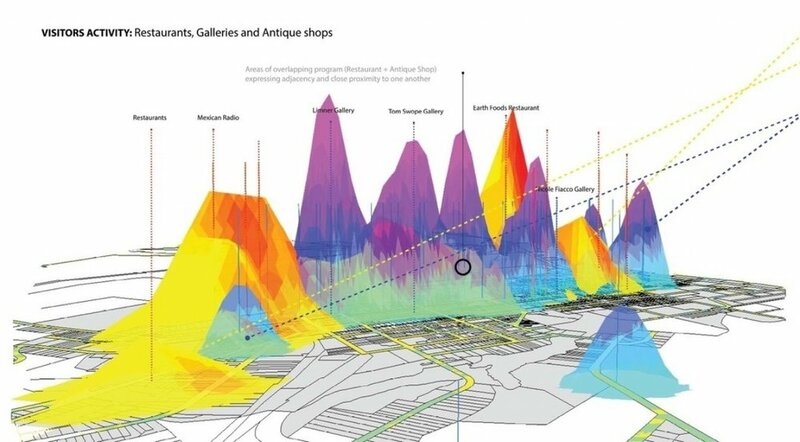 By mapping the urban fabric of hudson city, throughout he perspectives of both the local and the visitors of Hudson, an emerging pattern for areas of activity and inactivity becomes apparent. specifically along the highstreet, '‘Warren Street’. This allowed for the identification of potential locations where a new installation for our client OMI can be placed. Through GIS, information about the whereabouts and activities of locals and visitors at places such as churches, farmers markets, parks, Antique shops and restaurants from the years 2007-2012 were gathered and I was able to create 2D density maps, that in turn where visualized into 3d form. This allows for the visual overlap of different programs expressing adjacency and level of activity. Other areas identified were parking spaces and vacant lots, that act as a potential location for the new OMI installation.